Every summer, the Fraser Institute releases a report pointing out the average family now spends more on taxes than food, clothing and shelter. But is it really a bad thing that as our economy grows we spend less of our income on basic survival and more on better education, better health, parks, environmental protection and the other public services our taxes fund? And while their press release makes a nod to the fact that “taxes help fund important government services,” and “the issue is the amount of taxes that governments take compared to what we get in return,” there is nothing at all in the Fraser Institute report about what those returns already look like. This is particularly troubling when you consider that the report (and one of the accompanying infographics) compares taxes today to taxes more than half a century ago in 1961. Yes, 1961, before Canada had universal health care, the Canada Pension Plan (CPP) or paid parental leave. Think about all the roads and bridges we have built since 1961, all the schools, colleges and universities that were opened or expanded. Of course taxes are higher than they were in 1961! That’s because the the average Canadian family today gets a lot more out of public programs and services than the average family did in 1961. It is a fair question to ask if we get good value for our taxes, but that’s not what the Fraser Institute does. Instead, their report insinuates taxes are too high (“ballooned”) without actually providing evidence for this conclusion. Journalists who uncritically repeat this message are not doing Canadians any favours. The reality is that one way or another we all have to pay for health care, education, infrastructure, and to support our elders and neighbours who’ve fallen on hard times. If we weren’t pooling our resources through taxes, Canadian families would have to pay out of pocket and those who can’t afford it would have to go without. For most of us, this would mean a lower quality of life, more insecurity and less money in our pockets, not more. This is the key missing piece in the Fraser Institute’s consumer tax index. Without accounting for the services our taxes fund, comparisons of total taxes paid over long periods of time are meaningless. You don’t have to be a tax expert to see that this definition of “consumer taxes” is too broad and does not correspond to what a typical Canadian family actually pays in taxes (more on this here). The Fraser Institute report also tells us very little about what’s happened to the typical Canadian tax bill over the last 53 years, though it gives us a rough idea of trends. Business and personal taxes rose as a share of family income in the 1960s and then again between 1975 and 1985. 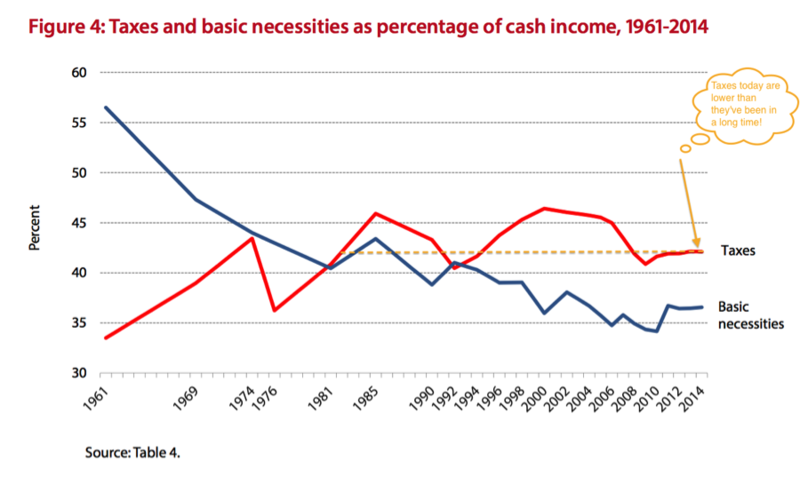 However, since the late 1990s, taxes have fallen as a share of income in Canada by what looks like about 5% of income. So taxes are actually lower now than they have been during most of the last 30 years—a fact highlighted in Figure 4 of the report, which doesn’t quite fit with the message of a “ballooning” tax bill. OECD research confirms this: Canadian taxes as a share of our economy (GDP) increased in 1960s and ‘70s when new programs were put in place, and have significantly declined since the late 1990s (by about 5%). Tax cuts over the last 15 years have seriously undermined Canada’s fiscal capacity and have made our tax system a lot less fair. Progressive taxes, which ask higher-income Canadians to pay higher rates (like the personal income tax), have shrunk as a share of the total tax bill while regressive taxes like the GST and other consumption taxes have gone up, taking up a higher share of incomes for lower-income households than from higher-income households. The loss of tax revenue since 2000 has starved our public services to the point where key programs have been scaled back or dismantled. Years of under investment have had real impacts on the lives of many families: larger class sizes and higher out-of-pocket fees in schools and universities; hospital overcrowding; reduced protection of our forests and water; fewer food safety inspectors; and the list goes on. The problem with Canada’s tax system today isn’t that average Canadians are paying too much tax, but that high-income Canadians and profitable businesses are paying too little. For more on that, and how to fix it, see this recent CCPA report I co-authored with Marc Lee.